The Fall and Expulsion of Adam and Eve in the Sistine Chapel, before and after restoration. Returning to Rome and the Vatican Museum after 28 years since my first visit in 1987, I recall the restoration of the Sistine Chapel in progress. The before and after was startling: the greyish, dirty tint had been rubbed clean to a vibrancy that was unreal and cartoon-like, and of course highly controversial in the world of art conservation. It proved though that art is a living thing, it’s old skin shed to expose color and detail hidden from centuries of aging. 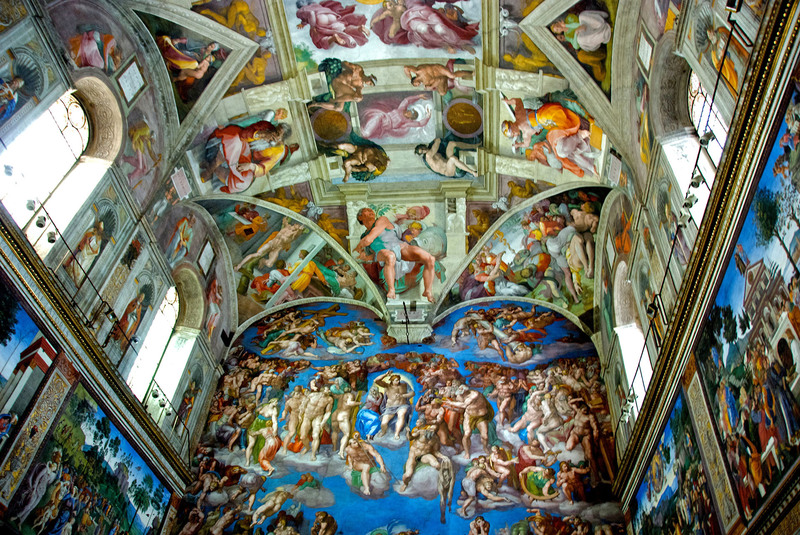 The Sistine Chapel also proves that art in its most advanced, living form is a totalized experience of the space it inhabits. Michelangelo’s epic-historical work is not to be hung on the wall, it is the wall, as well as the ceiling, inseparable in the way it integrates the configuration of the architecture: with its pillars, arches and curved ceiling throwing the paintings, quite literally, out into spectacular view all around and overhead. As a visitor, you can’t stand still, you find yourself leaning back, twisting and turning, trying to find the correct angle to view, but there is no one correct angle. Every perspective is a slice of the total gamut of the work. The Sistine Chapel is a direct descent of the Caves of Lascaux, where the space is inseparable from the work’s contours and perspective, incorporating the walls and ceiling into a three-dimensional rendering. 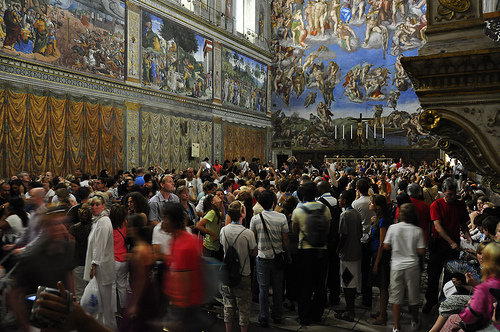 As a total work of art, the Sistine Chapel is immersive, site-specific and social. The waves of sonic reverberations that float through the air from the murmuring of voices in the resonant space (in spite of the guards’ “silenzio”) only adds to the overall effect of being immersed, literally engulfed in the work itself. I realize that this is exactly how art fully realizes its engagement with the viewer. At least for me, an object hanging on a wall without relation to the space that contains it, is a dead object. An object on a pedestal, in a frame, in a glass case, is art that has been mummified and preserved, sealed off from its surroundings and context. Art that celebrates the architectural, the sound, the space, the viewers, and joins them together as a totalizing experience, is art that remains alive. Like sonic reverberations, the total art work resonates and vibrates through the air bringing the viewer into a more visceral embrace of listening (or viewing). It is not just about the gaze and its cerebral mode of inspection. The open “sociality” of the total work of art brings us into a more direct, sensorial relation to its narrative, its meaning, and our transformation.